Savor the flavor of a ripe, sweet juicy strawberry blended with a home made cream flavor. Authentic, real fruit and cream flavors make this a daily vape for fruit and creamy vape lovers. Nice, big vapor production with subtle throat kick. This is a high VG e-Liquid. Named in honor of Dawn who helps many on their vaping journey. It's incedible what she does to help others and we thank her for that and for being the inspiration for this flavor. This is my go-to ADV. I love it. It's my base flavor for everything I mix. If I could improve it, I would add more strawberry flavor to it, but I can't, so what I end up doing is adding VeryBerry or RipeStrawberry - with a dash of JamaicanMeVape to it to help bring more of a berry flavor with a dash of tropical. The cream is subtle, but oh-so-perfect. I would miss the cream if it was gone. 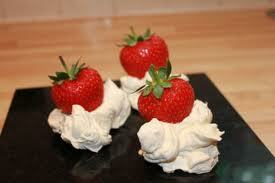 Dawn's strawberries and cream tastes exactly like fresh, sweet, ripe strawberries and whipped cream. Its so yummy. I have tried other strawberry flavors and they all tasted too artificial. This juice is awesome! The sweet strawberry is perfectly balanced with the wonderful cream flavor. This is an all day vape for me! I wanted Moo Juice ans found it was discontinued. I wrote to AltCig and found out this IS Moo Juice. This is a Awsome juice! So Creamy with a fresh strawberry flavor. Try it, You will like it!! I really like this one! Something about the cream helps take the strawberry to a smooth, warm level! I had given up on Strawberry Juice until I pulled the trigger on Dawn"s Strawberries and Cream. I swear I am eating Ice Cream with fresh Strawberries! I have vaped the 15ml from my order constantly and am back to get 70ml. Try this!